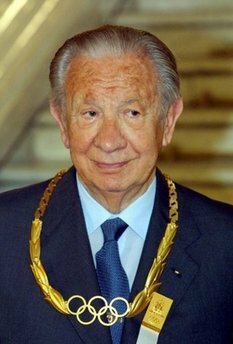 Former IOC chief Juan Antonio Samaranch wears the Gold Olympic order necklace at the Column Hall in Moscow in 2001. Spain& #39;s Juan Antonio Samaranch, one of the longest-serving presidents of the International Olympic Committee who was credited with commercializing the Games, died Wednesday. He was 89. Samaranch, who headed the Olympic movement from 1980-2001, passed away from a cardio-respiratory arrest at the Quiron Hospital where he was admitted on Sunday suffering from acute coronary insufficiency, it said in a statement. An honorary president for life of the IOC, he helped to revolutionize sponsorship and broadcasting deals for major events, seeking global sponsors instead of national federations making their own local arrangements. "Thanks to his extraordinary vision and talent, Samaranch was the architect of a strong and unified Olympic Movement," IOC President Jacques Rogge said in a statement. "I am personally deeply saddened by the death of the man who built up the Olympic Games of the modern era, a man who inspired me, and whose knowledge of sport was truly exceptional." His term at the helm of the IOC -- only Pierre de Coubertin, the "father" of the modern Olympics and IOC chief from 1896 to 1925, has held the post longer -- was marked by a major ethics scandal which led to a tighening of the rules. The IOC faced federal and congressional investigations in the United States into revelations that its members were given paid vacations, shopping sprees and cash payments to sway support for Salt Lake City& #39;s successful bid for the 2002 Winter Olympics. Under Samaranch& #39;s watch, the IOC adopted ethics reforms that severely restricted interaction between committee members and cities bidding for the Olympics in response to the scandal. Born on July 17, 1920, into a rich Catalan family which made its fortune from the textile industry, he served as Spain& #39;s minister for sport and ambassador to the Soviet union during the right-wing regime of General Francisco Franco. Samaranch remained active in Spanish sports administration after stepping down as the head of the IOC and was a key part of Madrid& #39;s failed bids to hold the Olympics in 2012, which London eventually won, and 2016, which went to Rio de Janeiro. "I know that I am very near the end of my time. I am 89 years old," he said in October 2009 before asking the IOC members for the honor of hosting the 2016 Games in Spain during Madrid& #39;s bid presentation in Copenhagen. A funeral mass for Samaranch will be celebrated at Barcelona& #39;s cathedral on Thursday at 6 p.m. (1600 GMT) which will be attended by Spain& #39;s King Juan Carlos and his wife Sofia. The king honored him with the title of marquis in 1991 for his work in the Olympic movement, which culminated in the award of the highly successful 1992 summer Games to Barcelona, a city the event transformed. Samaranch had been plagued by health problems in recent years and the hospital chief of internal medicine Rafael Esteban told a news conference late on Tuesday that "given his age, we can& #39;t be optimistic". He fell ill and went to the hospital after watching Spain& #39;s Rafeal Nadal secure a historic sixth straight Monte Carlo Masters title on Sunday on television, family members told Spanish media. Samaranch& #39;s wife Maria Teresa Salisachs-Rowe, another scion of a Catalan textiles dynasty, predeceased him on September 16, 2000. He is survived by two children, Maria Teresa and Juan Antonio Jr, who in July 2001 was elected an IOC member.